An article written in June, 2008 for National Geographic News revealed a surprising story. 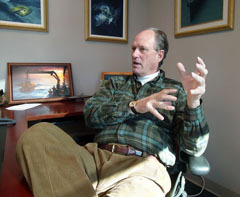 Bob Ballard needed funding to develop robotic submersible technology in his quest to find the Titanic. In 1982, he went to Ronald Thunman, at that time the deputy chief of naval operations for submarine warfare, with this funding request. The Navy was willing to fund his research, not to find the Titanic, but to investigate the wreckage of the U.S.S. Thresher and the U.S.S. Scorpion, two nuclear submarines that sank in the North Atlantic Ocean. The military wanted to know what happened to the nuclear reactors that powered the Thresher and Scorpion, both having sunk at depths of between 10,000 and 15,000 feet. This information would help determine the environmental viability of disposing of additional nuclear materials in the ocean. Also, the Navy wanted to know if there was truth to the theory that the Soviets had torpedoed the Scorpion in retaliation for spying. Ballard was willing to take on this secret mission with the caveat that he be able to also search for the Titanic, which was thought to be located between the two wrecks. Thunman stipulated that once Ballard’s mission had been completed, if there was time left, he could search for the Titanic. They would use his search as a screen for the mission. Ballard reported to Thunman that according to his data, both nuclear reactors were safe on the ocean floor – having no negative impact on the environment. Data also revealed that the Thresher had sunk “after a piping failure led to a nuclear power failure collapse”. Details regarding the Scorpion were not as clear-cut. “A catastrophic mishap” led to its sinking but there was no indication that it had been torpedoed. As a result of his search for the submarines, Ballard speculated about the effects of ocean currents on sinking debris. He surmised that the heaviest parts sink quickly, creating a debris trail according to the physics of the currents. With twelve days left in his mission, this turned out to be true. Using this information and the theory that the Titanic had broken in half, he believed that as it sank, the luxury liner left a debris trail. At 2 a.m. on September 1, 1985 Ballard was reading when there was a knock on his cabin door. He recounted the next few minutes: “Initially, they were seeing debris on the camera. But the moment I bolted in, the ROV (remotely operated vehicle) went over the boiler. We had a picture of the Titanic’s boiler on the wall, so everyone did a double-take”. The unsinkable Titanic was found at 12,450 feet. The Thresher was the lead boat of her class of nuclear-powered attack submarines. The submarine safety program SUBSAFE is believed to have been developed as a result of her loss at sea during deep-diving tests in 1963. The Scorpion was a Skipjack class nuclear submarine lost in 1968. It contained sophisticated spy gear and manuals, as well as two nuclear-tipped torpedoes. An inquiry was called after it was declared lost and its results were highly classified. You can read the original National Geographic Article here.